HANSON — Convenience now comes in the form of a locked, secure steel drop box in front of Town Hall into which residents may leave bill payments or official correspondence on off hours or in the case of persons with mobility problems. Interim Town Administrator Richard LaCamera announced at the Tuesday, Nov. 10 Board of Selectmen’s meeting that the drop box was officially in place, but that parking spaces along the horse-shoe driveway may need to be adjusted to improve access and traffic flow. “For safety’s sake we need to have room to pull in and room to pull out,” Sullivan said. The weather-proof drop box will be checked on a daily basis, or more often when needed with all correspondence delivered to the appropriate departments. Residents are asked not to make cash payments via the drop box. Between all the payments accepted by the Treasurer/Collector’s Office conducts 35,000 transactions per year, including real estate, motor vehicle and personal property taxes as well as water bills. Highway Department employees installed the device manufactured by American Security Cabinets, and the steel-encased cement safety poles that protect the drop box from bumps by vehicles. Voters at the October special Town Meeting approved a $3,000 transfer from free cash to install the drop box to aid residents, particularly handicapped or elderly persons, in delivering payments or other correspondence from their vehicles. Selectmen recommended it, but the Finance Committee had not done so. Former Finance Committee member Barbara Arena noted at Town Meeting that there were alternatives, such as online payments and mail, that work just as well and that $3,000 could be better spent on other areas. 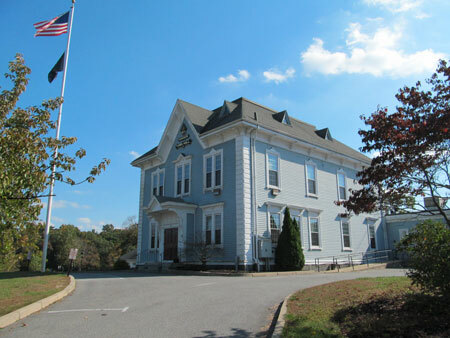 “I know a number of towns have this particular item in place, and its not only a convenience but … the easier you make the process to pay bills, the quicker your going to put that money into action for the town,” Selectmen Chairman Bruce Young said at Town Meeting. Assessor Lee Gamache also recommended passage of the drop box article. Hanson’s new secure drop box, into which residents may deposit payments or correspondence for all town departments, is located next to the flagpole in front of Town Hall and is accessible without the need to get out of a vehicle.